Similar to humans and other animals that have teeth it is of great essence to take care of the lionhead’s denture. This doesn’t mean that you have to brush their teeth once in a while. This is almost impossible and also not recommended since. There are however some methods to prevent dental diseases. It is better to prevent dental diseases than to cure them. How do these dental problems occur? They can occur if your lionhead rabbit doesn’t eat enough hay and or other vegetables. This is due to the fact that their teeth grow very rapidly. Eating enough hay makes sure that their teeth wear out. The most frequent heard problem is; overgrown molars. You can easily check whether this is the case by checking their molars on a weekly base. If you experience that they look somewhat overgrown contact a vet as soon as possible. It is of great essence that these problems are rapidly treated before they evaluate in even bigger dental issues. Preventing dental diseases is better than to cure them. If you have the feeling that something is wrong with the teeth of your lionhead abbit do not hesitate with seeing a vet. It is better to detect and possible diseases in an early stage. If your lionhead keeps having dental issues without you knowing about it there might arise other problems such as extreme pain and infections. As previously mentioned it might be wise to examine their dental health on a weekly base. Since their teeth grow very rapidly additional problems can also arise within a short period. Please note that it might be hard to check their denture since the lionhead probably won’t cooperate. 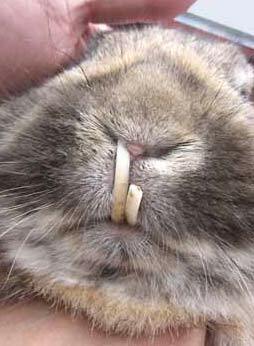 Be gentle and quickly examine their denture within a couple of seconds because it could be irritating for your rabbit. Do you have a tip or an easy method to check their teeth without being inconvenient for the rabbit please let us know so that we can add it to tis page. You can reach to us by sending an e-mail or fill in the contact form. My lion head rabbit has a bald space behind her neck. What could be the cause of this? I got two loin head rabbits in June for my 50th birthday, from my partner. They were 1 month old when I got them, they will be 3 months old the 20th of this month. I have loved having them around, so much fun, my dogs does not mess with them at all. I have a place fixed in my bedroom for them. I clean it daily. One is blue and she is named Aqua, the other is male black and white his name is What-Knot, they are getting their mane some, and looking great. These are the first loin head rabbits I ever had, I learning a lot. I going to fix What-Knot another place this week so I can put them apart, just to be safe. I’ve got to take some pictures and post them on face book and here, for everyone to fall in love with. Have a Blessed day. I am getting my first lionhead bunny soon. I previously had a guinea pig and let him chew carrots to keep his teeth shorter. Would this be okay for the rabbits as well? I use hay Cubs that you give horses and the bunnies I have love them, they are hard enough to keep their teeth short. Can I trim my Rabbits nails with a regular nail clipper of use a nail sander like an emery board? Use a cat nail clipper. They have round tips and work great.